How much does it cost to travel to Siem Reap? How much money will you need in Siem Reap? ៛130,888 ($32) is the average daily price for traveling in Siem Reap. The average price of food for one day is ៛45,514 ($11). The average price of a hotel for a couple is ៛95,493 ($24). Additional pricing is in the table below. These average travel prices have been collected from other travelers to help you plan your own travel budget. How expensive is Siem Reap? How much money do I need for Siem Reap? Located in northern Cambodia, Siem Reap is the closest town to Cambodia's famous Angkor Wat. It is a comfortable and laid back town and most visitors use it as a base to explore the country's most visited destination. Although Siem Reap was once a quaint village, it has continued to grow and change to meet the needs of the many tourists who visit every year. Siem Reap has become a very touristy town with easy access to restaurants, hotels, and shops. It also has a large expatriate community and the western influences are unavoidable. Although prices remain quite low, they are higher than you might find elsewhere in Cambodia. Siem Reap has a tropical wet and dry climate. The city remains hot throughout the year and the average high rarely falls below 30 degrees Celsius. The wet season starts in April and runs through the end of November, with the remaining four months making up the dry season. Angkor Archaeological park is the obvious attraction near Siem Reap. Angkor Wat is a wonderful and vast area that has too many temples to count. 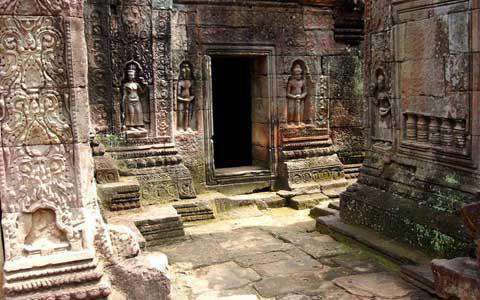 The most famous spots in Angkor Wat are the Temple of Angkor Wat and, in Angkor Thom, the Bayon Temple. Outside of Angkor Wat, there are several other attractions worth visiting in Siem Reap. The Angkor National Museum offers an excellent overview of the area. Angkor Silk Farm is an interesting break from temples and Senteurs d'Angkor Workshop is a fascinating place to go as well. The Landmine Museum is located outside of town and is a very eye opening and informative place to visit as well. Siem Reap's city center is known as the Old Market Area. This is where you'll find Pub Street as well as many restaurants, shops, bars and pubs. The Old French Quarter is where you'll find Sivatha Boulevard. There has been significant development in the area but there are still some charming colonial buildings. This is also where you'll find much of the area's luxury accommodation options and upscale restaurants. Siem Reap airport and the surrounding area is growing and developing. There are several large hotels, traditional khmer villages, and a big theme park and museum. Wat Bo Road is on the east side of Siem Reap River and has interesting restaurants, hotels, and bars. It has become less budget friendly and more trendy in recent years. Charle de Gaulle Boulevard is the main road to Angkor Archaeological Park. It has several hotels and restaurants along it. The nightlife in Siem Reap is driven by the tourist crowds and there is no shortage of bars where you can relax, grab a drink, and chat with fellow travelers. It's not an authentic Cambodian experience, but it can be fun nonetheless. Other activities around town include ceramic classes, cooking classes, and cultural performances. Festivals in the area include the Angkor Photography Festival and the Water Festival. Siem Reap has food options for all tastes and budgets. Most restaurants are designed specifically for tourists and price may reflect this. Still, competition keeps prices low by western standards. You'll find everything in town from Asian staples to pizza or traditional Khmer food. Fine dining is available as well. Many of the town's restaurants are concentrated a few blocks north of the Old Market, but there are also options available along Wat Bo Road. Some hidden gems are also found in the surrounding neighborhoods. In the Old Market area you'll find restaurants along The Alley. These restaurants are quieter than what you find on Pub St. and can offer a pleasant experience. Local restaurants are also nearby on Phsar Chas and offer similar menus with fried rice, Khmer dishes, and the standard western options. Many people travel to Siem Reap from Thailand either overland or by plane. Flights are obviously the more expensive option, but are efficient and reliable. If time is not a concern, you can take a bus to the border from Thailand and pick up a ride once in Cambodia. The road on the Cambodia side is in poor condition and frequently floods, which means your trip may be very slow and unpredictable. Once you arrive in Siem Reap you can easily walk around the city center. It is very compact and shops, restaurants, and hotels can all be reached on foot. Angkor Wat is about a 20 minute tuk tuk ride from the center of town. You can explore Angkor Wat with either the Little Circuit or the Big Circuit. Bikes are a fun way to get around, or tuk tuks are readily available for hire. Many people purchase a three day pass to the park and spend the first day doing the Little Circuit with a tuk tuk and the Big Circuit the following day with a rented bike. The area is generally flat and bike riding is relatively easy. During the evening hours traffic can become very congested and navigating on a bike can be somewhat scary. There are electric bikes available as well, but these are generally not recommended as they are unreliable and often break down, leaving you stranded in the most remote areas. Rent a bike to see Angkor Wat. Its a very flat path and it'll let you see the temples at your own pace. Take plenty of water, start early in the morning, and be prepared to dodge some traffic on your way back, but renting a bike in Angkor Wat is the best way to go! One of the must have experience in Siem Reap is to see the sunrise. It's a stunning site, but do keep you expectations in control. You will share the experience with everyone else in the area, which does detract from it. Try to head deeper into the temples to get away from the crowds. The light will still be wonderful, and if you're interesting in photography, you'll absolutely get the best shots this way.